Fast Printing Services – FastPrintingCo. FastPrintingCo. is a printing & design company that strives to be the best. Our company was started by two entrepreneurs, 2012, that wanted to offer high quality printing at an affordable price. FastPrintincCo. will save you time and money! FastPrintingCo. specializes in business card and marketing materials printing. We will ensure your printed materials exceed your expectations! After all we are here for you; if you’re not happy we’re not happy. We love printing and marketing and can’t get enough! All of our products are printed on recycled paper and all inks are soy based. Soy based inks are not harmful to the environment. Check out our Eco Friendly page. Our customer service is unmatched. Like we said we strive to be the best. Please don’t hesitate to email or call us if you have any questions. We know that you will not use anyone else once you’ve printed with us. Business Cards, Flyers, Brochures, Postcards, we print them all. High quality printing at a crazy price! Your business card is in many ways the most basic marketing tool that you have. In its simplest form, it conveys the basic information about your company in a format that is easy for your customers to store and use. In this day and age, standing out from the rest is a necessity. 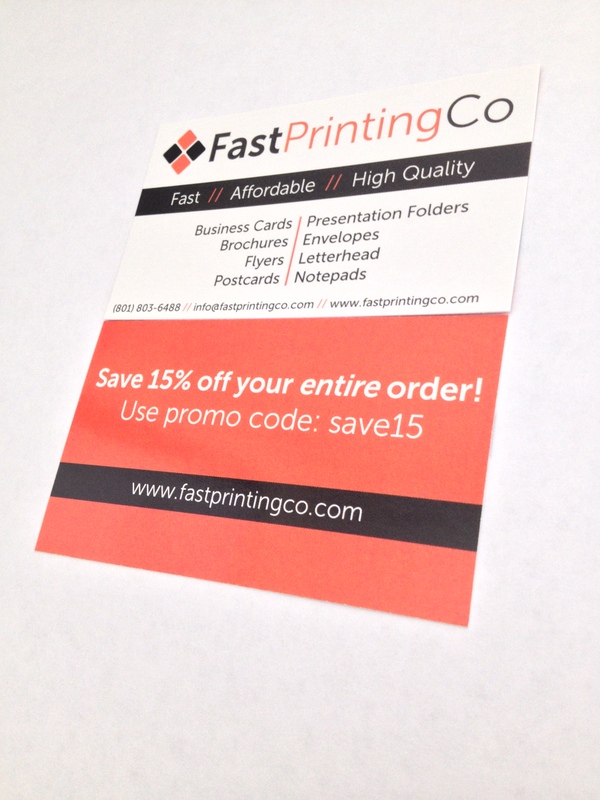 That’s why you need to print high-quality business cards from FastPrintingCo.com! Whether you’re a corporation, small business, or an individual that needs business cards we can help. We strive to keep our prices low without affecting the quality of our products. Our team is committed to ensure our customers get the business cards they need quick and affordable. We offer vibrant full color printing that will surely stand out. We can also design a business card for you for a small fee. Once we design it, it’s yours to keep. We will send you the file when we are done. Don’t miss out on a great product and always keep an eye out for special promotions and coupon codes.